I look to get back involved in a spread that we were involved with back in June with a positive outcome. The formation once again looks like a great spot to re-establish the trade. The fundamentals remain mixed as supplies and production appear to be on pace for the year, which has lead to the 400 point sell-off since the end of July. However, open interest continues rise and has reached the highest levels since our involvement in late June. This perhaps is suggesting we have quite a bit of short positions that have been added as we reach oversold territory. Should these traders begin to head to the sidelines, this should provide the support needed in the October contract for this spread to narrow before October comes off the board. 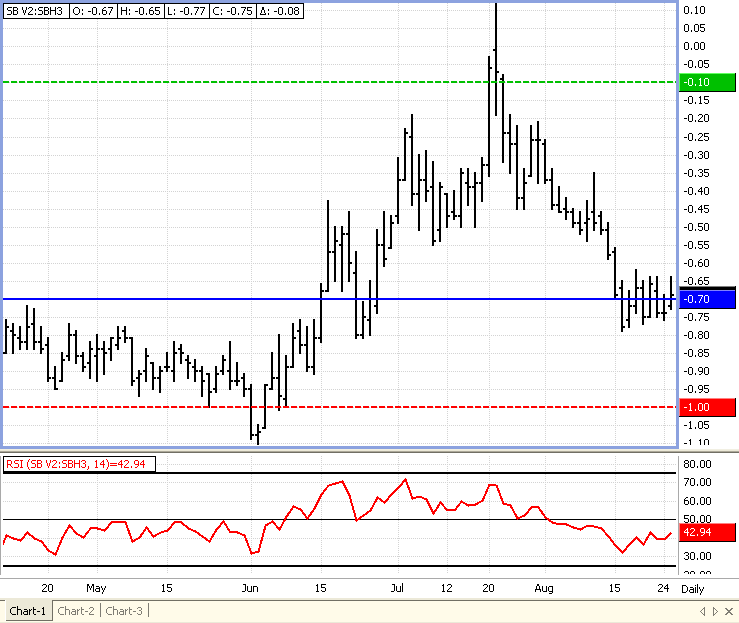 This spread has 1 month to make its move as we will have to be out of the October contract by September 26th. THE RISK OF LOSS IN TRADING FUTURES CONTRACTS OR COMMODITY OPTIONS CAN BE SUBSTANTIAL AND THEREFORE INVESTORS SHOULD UNDERSTAND THE RISKS INVOLVED IN TAKING LEVERAGED POSITIONS AND MUST ASSUME RESPONSIBILITY FOR THE RISKS ASSOCIATED WITH SUCH INVESTMENTS AND FOR THEIR RESULTS. YOU SHOULD CAREFULLY CONSIDER WHETHER SUCH TRADING IS SUITABLE FOR YOU IN LIGHT OF YOUR CIRCUMSTANCES AND FINANCIAL RESOURCES. YOU SHOULD READ THE “RISK DISCLOSURE” WEBPAGE ACCESSED AT www.danielstrading.com AT THE BOTTOM OF THE HOMEPAGE.